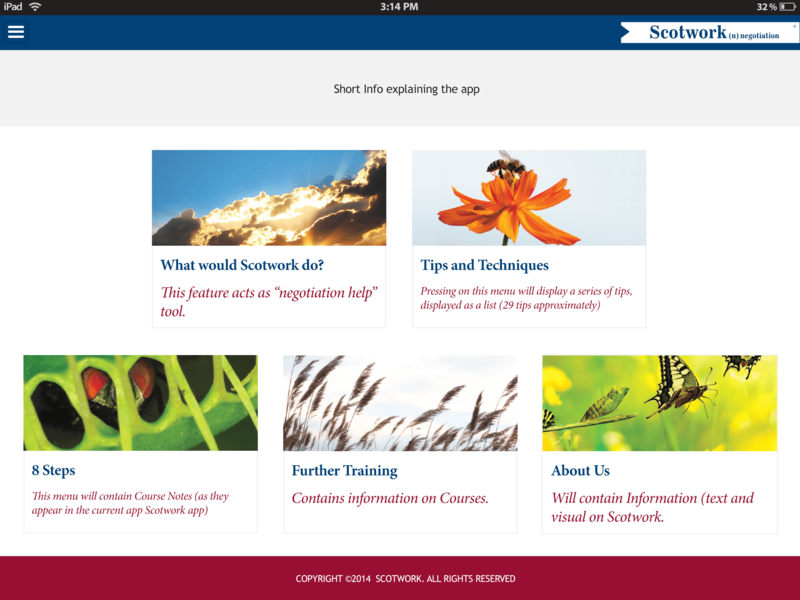 We were commissioned by Scotwork to overhaul their existing iOS app. The app was difficult to use, hard to maintain, and lacked visual appeal. To overcome these problems, we first undertook a thorough UX (user experience) review and design. UX design was key for Scotwork; they had a lot of information they wanted to get across to users, but they needed to do it in a user friendly, intuitive way that would not deter users, as had been the problem with their original app. We therefore produced an interactive, clickable prototype for all platforms. This allowed the client to visualise how the app would work across phone, tablet and desktop platforms. We refined the prototype until it was right, with the help of user feedback. Once this stage was complete, we undertook the visual design of the app. We worked in conjunction with the client’s brand guidelines to produce a design that complemented their existing website and branding material. The client then used the designs we produced to develop their solution.